Carye Blackwell has been with Houston Furniture Bank for nearly two years. During that time, he has worked his way up from being an entry-level warehouse hire to becoming warehouse manager to taking over the administration of our Mattress Recycling Center. Wherever Carye has applied his talents, processes have improved, morale has increased, and outputs have skyrocketed. In a nutshell, we are very lucky to have Carye here at Houston Furniture Bank! Carye was hired in 2017 by our newly-onboarded Director of Operations, Bill Lindsay. A father of six, he was struggling to find a position that would value his extensive management and entrepreneurial experience because he was blocked by a criminal record from when he was younger. Stepping into his role as Warehouse Manager shortly before Hurricane Harvey, Carye rose to the occasion by managing the unprecedented level of donations and their distribution in the following weeks and months. He took the initiative to organize the warehouse as a whole, allowing for greater efficiency. Now overseeing our Mattress Recycling Center, Carye is respected by his team and does a great job of welcoming the community service workers who work with them on most days. In the past two years, Houston Furniture Bank has increased the number of mattresses being recycled each month by more than 50%. Houston Furniture Bank employees and volunteers work together to recycle an average of 100 units a day! 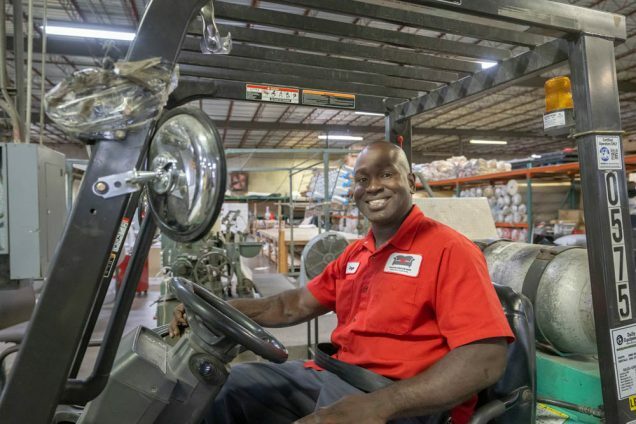 For over 25 years, Houston Furniture Bank has been a Second Chance Employer, proudly providing opportunities to formerly incarcerated individuals. Having a criminal record can mean a lifetime of minimum wage employment for skilled individuals who are trying to provide for their families. Carye notes that those who have made mistakes and do not find opportunities often continue on the same path of “poverty and despair within the family unit.” Here at Houston Furniture Bank, we take great pride in the knowledge that we have given dozens of men and women the opportunity to build their employment history and enjoy a fresh start.